I hope everyone is having a fabulous weekend. I certainly am. But even though the workweek is over, the mind still remains geeky! So, when I saw this image, I knew I had to post it here. 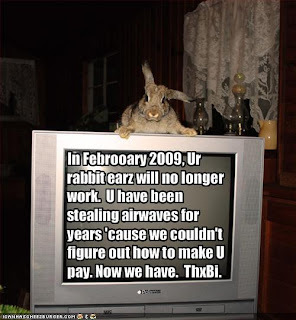 It made me laugh out loud, even if they did take liberties with the reasons behind the DTV transition. Enjoy, courtesy of Icanhascheezburger.com. Levity aside, stay tuned! Next week, I’m featuring a FIVE-PART series on A/V Consultants – How to pick them and how to use them to best result. Until then, Cheers!